she has been way too good for me. How many of you like ghost stories that are creepy? I do, but this is a different type of ghost story. It is fun and cheerful! Phoebe the main character needs a change. She moves into an unusual apartment, I say unusual because instead of it feeling like haunted house, she sensed happiness. There she meets three ghosts by the names of Isolda, Polly, and Hazel. All three of them teach Phoebe how to live life. Three ghosts, who almost feel like the best friends I never had. Why oh why can't I meet three friendly ghosts? In this heartwarming tale of starting over and finding yourself, I found myself laughing and crying. Cheering Phoebe on all along the way. I think every girl can relate to Phoebe in some way or another. Even if she couldn't see her beauty, I could through the pages of the books. Bathey did a great job with bringing such an interesting character to life the way she did. I feel like Phoebe is real and I know I could easily be friends with her. I wanted to thank Lorena again for introducing me to such a fun loving book. I look forward to reading more books. 1. Thank you for joining The Lovely Books today, first and foremost, how are you doing today? I am doing fantastic. It's a bit rainy here but I like that. I started officially when my first book came out in 2005. My first book was a memoir, Happy Beginnings: How I Became My Own Fairy Godmother. The story came about as I started writing about the changes my life was taking after losing my mother to cancer and my husband leaving me. It was earth shattering losing everything I really knew within three years, so I started writing about the loss, myself, and who I wanted to be. The story was about starting over and how women really get lost in roles and forget to put their happiness as a priority. While writing my memoir I began a novel called, Beatrice Munson. I wrote half of it and put it away. In 2010 I picked up Beatrice Munson again and finished it in nine months. It was the beginning of my career as a novelist. 3. How did you come up with the title to House on Plunkett Street? I knew the story was going to take place in this apartment and I don't know, the name just sort of popped into my head and it worked. Dog...my dream dog is a brown Newfoundland. I already have a name picked out for him, George. 5. 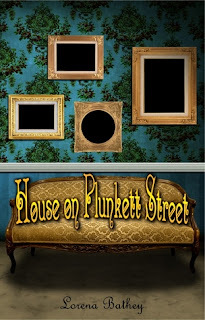 Tell us a little about House on Plunkett Street. It is the story of a woman in her late twenties, Phoebe Bertram. She's always been ignored and overlooked. She's bland and just has a mediocre life. Then things start getting shaken up and she has to move into the apartment on Plunkett Street. Everything begins to change when she moves in. The house seems to have energy of its own. Then one night she dreams of three women from different eras sitting on her couch. Amazingly enough, these same women come back and begin visiting Phoebe. They become like life coaches and teach her about how to not merely just exist in her life, but live it. 6. Do you see a little of yourself inside of Phoebe? Not so much myself, as a lot of young women I know. It seems these women in their late twenties to early thirties aren't quite sure what they want. And this story is about how easy it can be to simply float along letting life pull you without engaging in what happens to you. Phoebe isn't a bad person; she's just not sure who she is. These ghosts that come back have learned a thing or two and the show what steps to take to change. But the work is done by Phoebe. I guess I felt it would've been nice to have had someone guide me. There is so much possiblity but yet not always the support to make daring decisions. 7. Who are your literary heroes? I love Stephen King. I love his amazing way of building, developing, and incorporating characters in a story. He's a master at it. I love Shakespeare. His words are so beautiful at times and raunchy at others. When they are heard as a play, they take on such unbelievable dimension. I also love Jane Austen. I know...so girly. But Jane was able to create characters with great balance and stories that made you hate people in them. That's a talent. 8. What are your favorite books to read? Have a secret spot you read them at? I have very eclectic taste. One night I'm reading Janet Evanovich Stephanie Plum books the next Stephen King's The Stand. I like to read books that are interesting and different. I hate being able to figure out the whole plot of the book in the first few chapters. I like to get comfy on the couch with a cup of tea and a lot of pillows to prop up my head. As long as I don't fall asleep, it's great. Deep purple. It's actually one of the colors I've chosen for my wedding. 10. What is your idea of the perfect man? My fiancée. I know that sounds so corny huh, ugh! But it's true. He is the perfect man....for me. That is the most important thing that women need to know. There is no perfect man, but there is a perfect man for you. Mine is smart, strong, gentle, adores me, understands me, makes me laugh like crazy, and is my best friend. 11. Any future projects in store? Oh yes. I have nine novels in my writing queue. My next book is a thriller called, The X. It's about a woman whose happy life in suburbia is shattered one day when her husband files for divorce and then lures her teenage boys away. She finds out there is more going on than she could know and has to become strong to find out what's going on and get her boys back. She teams up with an ex-FBI guy and it's a wild ride. 12. Do you have any advice for aspiring writers? Yes, write. It is that simple. Don't worry about whether people will like it or what you're trying to say. Just write what you want and keep writing. Eventually it will all come together. That's when you can go back and get a professional editor to help you clean things up. Second piece of advice. Get a thick skin. Not everyone will like your books and plenty will tell you why. Take that criticism and use it to make you a better writer, and then keep writing. 13. What are some words you would like to share with your fans? First, thank you for being fans and buying my work. I like to tell stories and I love to bring new and interesting characters to the page. 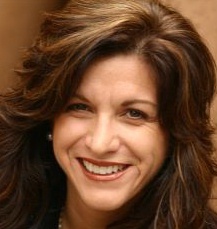 Please write me at Lorena@LorenaBBooks.com if you have anything you want to say. I love critique that makes me better. Or if you have an idea, need some support in the writing process, or just want to be friends. Being a writer can be lonely, so we authors have to stick together. But mostly, remember to follow your dreams. Because when you do you'll be amazed what life brings you. Thank you, Jessica for the opportunity to answer these fun questions. I am so glad to be able to connect with individuals like you who give such support to us authors. You bring our work to light and I am eternally grateful for that. Thank you so much Lorena, it was such a pleasure getting to know you and read your book. Your answers were very honest and heartfelt. I look forward to working with you in future projects. My review will be up tomorrow because I want all the spotlight to be just on Lorena for tonight. Tomorrow all the sportlight will be about her book House on Plunkett Street. Which reminds me, go and sign up to win a free ebook! The giveaway ends on 21st of this month. So if you have not yet entered please do asap, and help spread the word about this wonderful author. Lorena Bathey, author of House on Plunkett Street, is offering FIVE free ebooks to five lucky winners who enter the giveaway. How cool is that! The interview and review will not be up until later this week, possibly the weekend. But the giveaway is starting tomorrow! Get ready to tweet and win some books. "Phoebe Bertram is boring, bland, and unexciting. She works a job that is inadequate of her abilities. She has a boyfriend that is a dud. She is on the treadmill of her life and doesn’t know how to get off. What she never expects are the three ghosts that arrive on her couch to teach her how life is really meant to be lived"
So I can't find a summary anywhere! hahah. I wanted you all to see an overview of the book. But I guess you will just have to read my review instead. Charlotte has done it again! NO seriously she has. An amazing writer, and a great friend. Yes, Charlotte I consider you a friend. It is so funny because the name of the book was changed so many times. Once upon a time it was called Finding Valor, then it was called Empty, and finally it's name was found. Taken FTW! Taken starts off with a bang. Of course Channie and Josh are now husband and wife. Yay, so sweet. Josh is so cute and such a good guy, but I think my heart lies with Hunter. He is so stinkin' redneck that I find myself eagerly awaiting his scenes in the book! Do I want him with Channie? Of course not, I definitely see them as just friends. Although I wouldn't mind seeing a love triangle. I know I have said I hate love triangles, but honestly if it is done right, I like it. Channie and Josh have a perfect relationship in my opinion. Too perfect. Or so Charlotte has us think. Because in Taken, Channie and Josh have a big fight, the first as a married couple. Josh was a tad bit melodramtic if you ask me. And in the second book I started finding myself getting annoyed by him. Yes, I do like Josh, but he definitely showed his immature side in Taken. Which is to be expected since he is a teenage boy. I forgot what they could be like at that age! Anyways, they got in a fight and of course made up later. Love..especially at the honeymoon stage, it really was very sweet. They have a sweet sweet love. Guess who comes back in the second book? Abby, her beloved sister who I was not very fond of in the first book. She came back with Diego, who was actually a decent guy who loved Abby and The Trips. Channie's Mom...umm. Yeah..I pretty much hate her with a passion. A PASSSION! She has never been a character I liked. 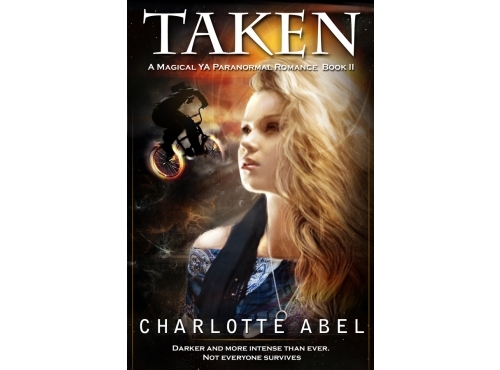 She treats Channie bad, and in Taken its worse. What is even more worse than that, is Channie lost her powers in the first book. So she can't defend herself against her own mother. The only thing I was disappointed in was the fact that I felt Josh was throwing away everything for marrigae and Channie. I am all for marriage and love, I believe in love at first sight and destiny. I just wish they didn't have to get married so young. He had a lot going for him and I hated to see him chunk it out the window. But this is where I give praise to Charlotte because it is realistic. So many young adults and teens let their feelings get the best of them and in the end it usually does not work out. Not saying that Channie and Josh will end up like that because their love is pure and true. Just saying that people do these kinds of things and end up regretting what they did in the end. Which by the way, is a stripper now! hahaha. I think it suits him well. The rest of the information is on the post. Hope you join in the fun!